Happy Chinese New Year! 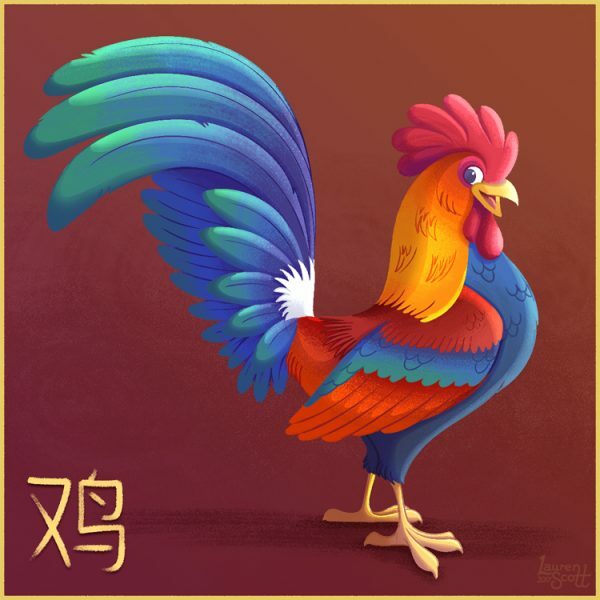 In honour of the Year of the Rooster. I am a highly creative and dedicated artist based in London, specialising in character design, illustration and the wider area of visual development for animation. I'm currently… Show more. Send a message directly to Lauren Scott. I am a highly creative and dedicated artist based in London, specialising in character design, illustration and the wider area of visual development for animation. I'm currently available for work, please get in touch and we can work together to bring your project to life! Awards: Winner of CGMA's Christmas card illustration contest 2012, graduated with the highest grades ever awarded for a Masters degree (Animation) from the University of Hertfordshire, Vanity stills from my short film 'Totem Trouble' has been published in '3D World and 3D Artist', my short film 'Slim Pickings' has been screened at multiple film festivals.